Mid-Century Pictorial Map of Panama - Fine Print Reproduction - the Vintage Map Shop, Inc. 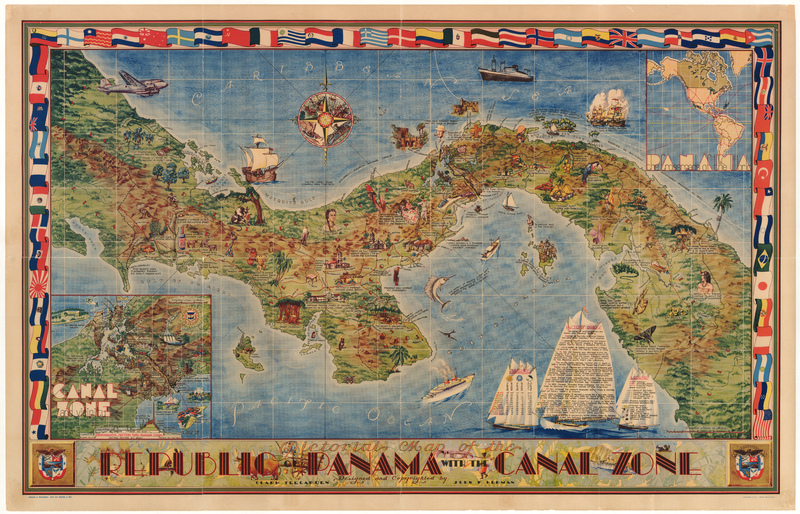 This is a fine print reproduction of a striking large decorative map of Panama that was originally created in 1941, just before the military involvement of the United States in WWII. Two young American architects, John Herman and Clark Teegarden, who had been living and working in the Canal Zone just before the start of the war had gained intimate knowledge of the area and its history. It is thought they were inspired to create their map by earlier pictorial maps of the region such as Ashburton Tipp’s wonderfully exotic work of 1930 entitled A Map of Castilla del Oro Panama on the Spanish Main. Herman and Teegarden’s map differs significantly from Tipp’s in its treatment of historical, commercial and topographical detail. Rendered in appealing earth tones, this well-balanced map is distinguished by both its aesthetic appeal and the wealth of information provided by it. The lifestyle and undertakings of indigenous peoples are rendered in imaginative vignettes in many places, illustrating the diversity of these peoples. Historical sites and events are noted, such as the specific location of timber harvesting and early Spanish gold-mining operations, and both the sea and land routes of early explorers are depicted. Flora and fauna are well represented, as are many of the natural resources of the region. The first sail of three sailing ships plying the waters of the Gulf of Panama contains information comparing weather in various parts of the world, the second contains historical notes starting from the initial period of Spanish dominion of the area and ending in 1941, and the third is used as a backdrop for the legend of the map. The map contains two insets, one depicting the canal zone itself in detail, and the other showing North and South America with the Canal labeled as ‘The Crossroads of the World’. Historically speaking, from the time of early European interaction with locals, Panama was the first 'official’ Spanish colony in the New World. Having been claimed for the crown in 1509, it was known as the door to the seas and the key to the universe. In the 1530’s, it served as a launching pad for the Spanish conquest of the Incans, and it served as a transshipment point for gold and silver shipments destined for Spain until the 19th century. Dominion over the region changed through the ages, and the region known today as Panama was seldom a fully independent state until the late twentieth century. This map depicts the area when the Canal region was yet under US control. Starting in 1903, a large area of central Panama, including five miles on either side of the canal, was an unincorporated territory of the United States, and in 1904 the Isthmian Canal Convention granted overriding control and protection of this territory to the US in perpetuity. Completion of the Panama Canal, one of the greatest engineering feats of all time, was completed in 1914, and administration and control of the canal was assumed by an American ‘governor’ whose authority was reinforced by the presence of US military troops. The US did not relinquish control of the Canal until 31 December 1999.